i have a project with many partial templates and included bootstrap css. there is no completion when typing ". Only html tag completion works. So angularjs autocompletion works in js-files, but not in html (attributes). Completion from /css files linked to HTML using <link> tag should work. Please can you attach a sample project that shows up the issue? I have attached my sample project. 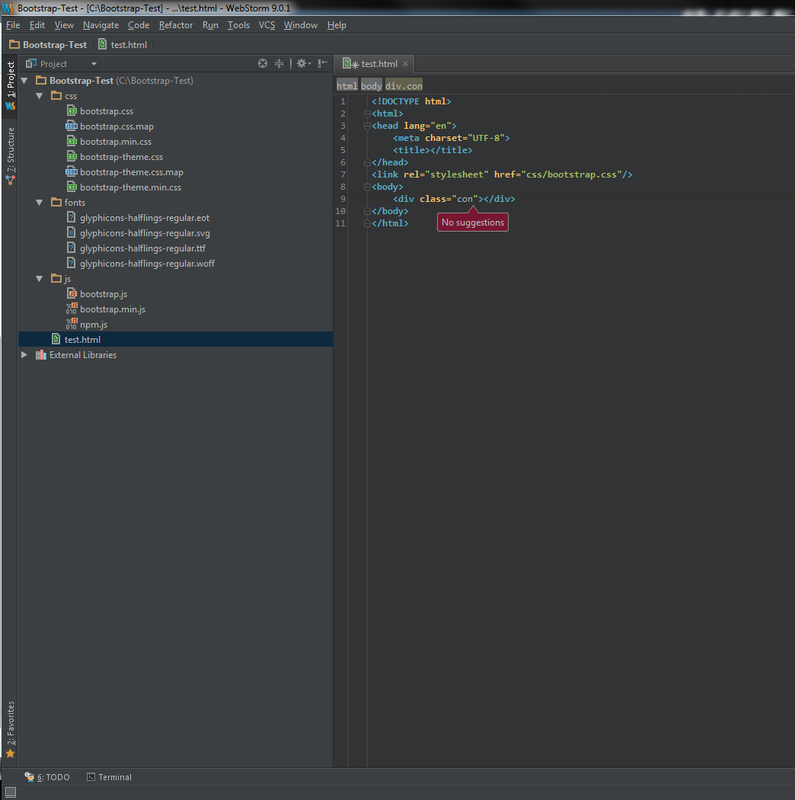 I think it is possible that i have misconfigurated my webstorm. Can you record a screencast that shows you steps, etc.? Are there properties to deactivate that? Can i attach my exported settings and you try? I'm more interested in the screenshot of your editor than in your steps actualy - just to make sure that everything looks as expected. BTW, does popup appear when you press Ctrl+Space? thx for your help. Bootstrap is important for us (i try this tool and maybe we will use that in our company). 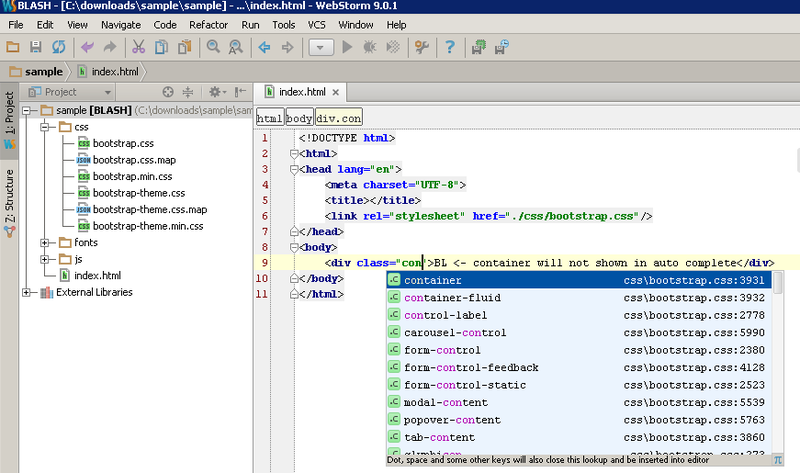 Please put cursor on 'con' and hoit Alt+Enter - what popup is being shown? Oh thanks now it works. There was a popup and i've clicked the last entry (i don't know what it was because it don't appear now), and after clicking i had all bootstrap suggestions. But what was the problem? Is that the common way to activate this? Could you please tell how to inject class completion back? I have same issue, I've uninjected class completion from "class" attribute. Now I can't find a way to take it back :) What are default settings for css-class injection? I am working on an Angular 2 project and when I try to insert .container [bootstrap class] and press Ctrl + Space, it doesn't auto-complete the <div></div> tags inside .html file for me. Earlier it was working. Now I have to type everything manually. Why is that? I have figured it out. It's working now. 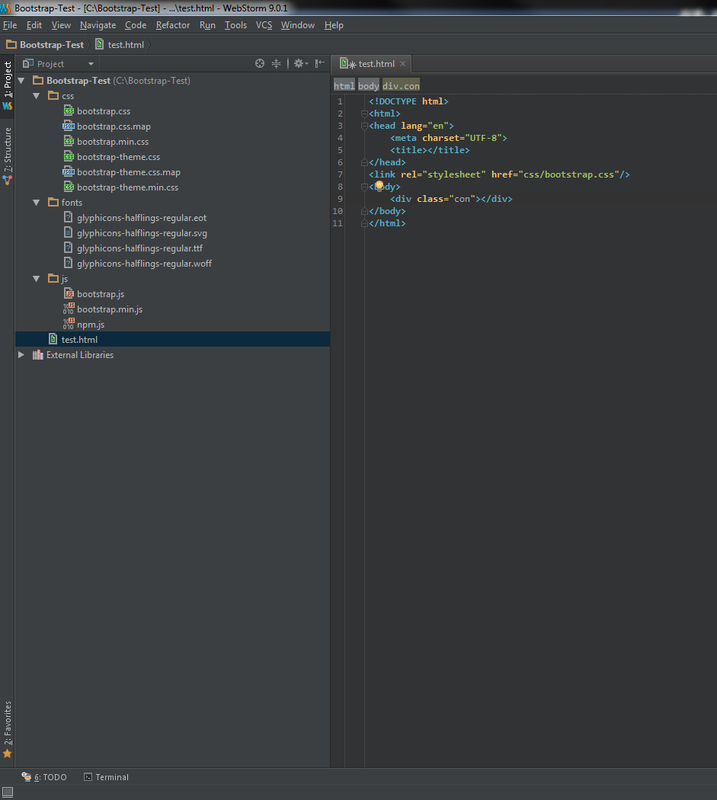 Yesterday I was working on a LARAVEL project (which has been completed). 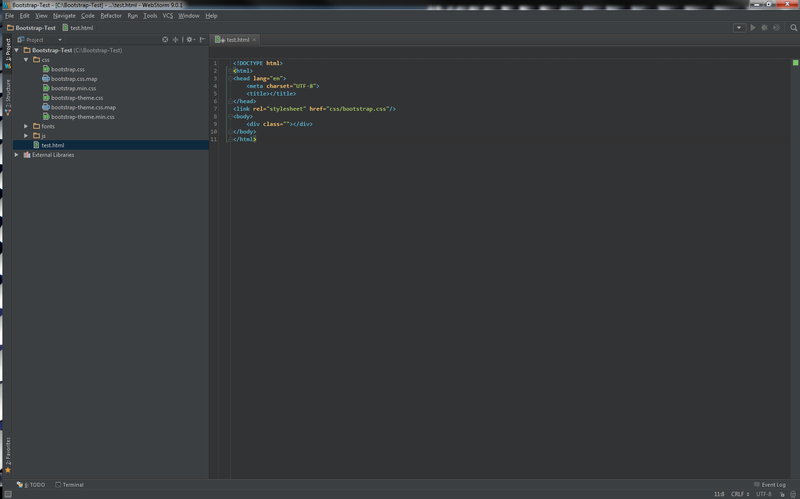 There I used Bootstrap 3.7.x and it works EXACTLY AS EXPECTED. But today I started another project and it is plain HTML, no framework involved. I did everything (like: imported bootstrap.css using LINK tag). Please help me, I am a programmer and My head is already full I cannot memorize all the bootstrap classes. Please give me a working solution. I am a kind of pro in this IDE so ask me anything. NB: I did not changed any setting from my ide from last laravel project to this html project & using same version of bootstrap, so where's the problem? Hope I will get some solution from you, Don't hesitate to ask for more inquires, It seems many people having this problem, so we need this eliminated ASAP, I suggest making a plugin to support all bootstrap classes suggestion, I seen 2 plugins already there to help with bootstrap but in my opinion that's are just junk. I don't want to emmet like feature (which they offer), I just need BOOTSTRAP class suggestions like laravel project. for example "table-striped" is actually exists in the bootstrap.css file, I checked that manually. so why not that is showing in the suggestion? and I'm right in this coz if I call class called "table-striped" then it actually works (but that was not in the suggestion). so we know we sure about it that, that class exists in the bootstrap file, this is why that worked regardless of suggestion of that IDE. but neither in components html. Ok, thank you for the tip. This answer http://stackoverflow.com/a/35410548 helped me include Bootstrap dir. I have an issue with the way the implicit includes are working. I use a sitemesh decorator for my page html templates that includes bootstrap.css and other resources. I then edit my view jsps without any html template code. When editing the view jsps Intellij usually picks up the css files from my webroot automatically and includes them for auto-completion. 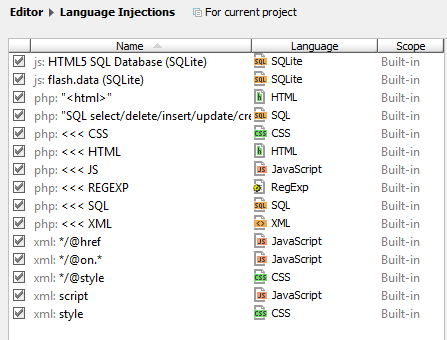 However, sometimes I want to add an additional css file for a particular view jsp. For instance font-awesome.css on the one or two pages it is used. To do this I simply add it to the header of that particular view jsp. The problem is that when I do this, Intellij stops implicitly including any of the other css from the sitemesh template and I lose autocomplete for all of the other standard project css. There must be a way to configure this behavior. "Always Include CSS" or some such. Does anyone know how to configure this? Any html using template files for decoration seems like it would have this issue in Intellij and that is too common a development pattern for this to be an unsolved problem. >The problem is that when I do this, Intellij stops implicitly including any of the other css from the sitemesh template and I lose autocomplete for all of the other standard project css. Wow. So there are three open issues on this dating back to 2011 and still no fix? 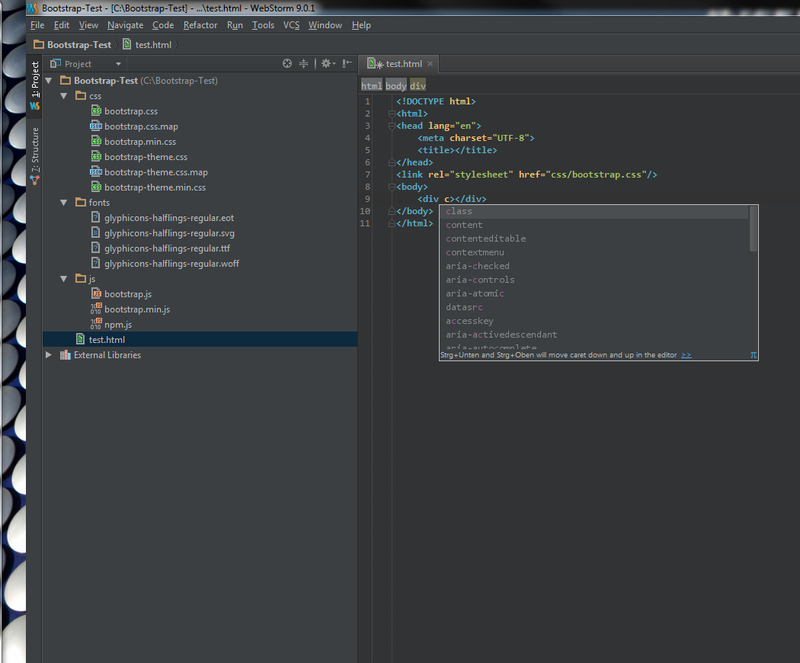 Not even any activity visible on the issues from JetBrains personnel except passing from one assignee to another. It seems to me that this would be affecting a lot of people and the fix should be very very quick to implement. You already have the code for both behaviors (include everything, include only references from the file). A simple boolean flag in the config should allow the user to select the code behavior desired. I assume you folks have a lot to work on but it seems that a junior dev could push this out in a couple hours max. I believe that these issues should have their priority bumped as they are not getting any attention at the current level. I had this problem for a long time and I don't know why but if you put <html> tag in your template the autocomplete doesn't work. BTW, all mentioned tickets (WEB-2223, WEB-23986, etc.) are fixed in 2018.1. IDE will suggest CSS classes from all CSS files when no variants from the linked CSS files or within the <style> tag are found or if code completion is invoked twice.